Ya Jagoff!!! | A Green-Light Block-Blocker! Home Uncategorized A Green-Light Block-Blocker! Thanks to Guest Blogger, Rachael Rennebeck for the post today while John out buying discounted back-to-school items to sell on eBay. Blame it on not having blue tooth and answering a phone call, or worse yet a text message. Then again, you could be spitting tobacco into a plastic bottle, changing the radio station, or reaching for a handful of greasy fries. All are driver distractions, but no excuse for sitting at length during the duration of a green light. As a female driver I am allowed to admit that the sun gets bright this time of year making the traffic light difficult to view. Plus, back in the early days of railway lights, green meant “caution,” while the “all-clear” light was, well, clear or white. Okay not true as a reason, but only a woman would look up the history of the traffic light. Men could and would tune it all out and drive, women are multitasking machines. So, why did this car sit through a green light? Probably a woman driver wondering why the man’s voice on the GPS declared to proceed to the route. It’s a green light ya jag off! 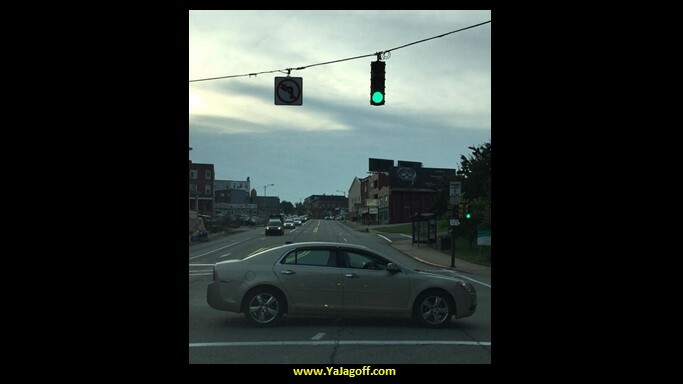 Get outta the intersection YaJagoff! Thanks to our bud K. Conway for being today’s Honorary Jagoff Catcher! Great pic! Previous article#YaJagoffPodcast – 85 From The Pittsburgh Irish Festival with an All-Female Cast (almost). What Should Be the Top Pittsburgh Adult Halloween Costume for 2015?